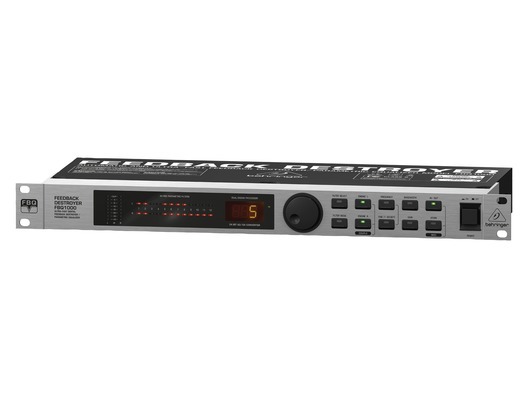 The Behringer FBQ1000 Feedback Destroyer is a rack-mountable solution for fast and effective feedback suppression during live performances. The FBQ1000 Feedback Destroyer is the fastest feedback suppressor on the market, with a response time of less than 0.2 seconds. Whether you use it to kill feedback dead in its tracks for your mains and/or monitors, or as a sophisticated parametric equaliser to fine-tune the acoustics of your next gig, the FBQ1000 will bring a new level of finesse to your sound. And if you use in-ear-monitors, the FBQ1000 is a must-have to protect your most valuable assets - your ears! FBQ1000's Auto mode continuously monitors the mix, resetting programmed filters automatically to eliminate the slightest hint of feedback - without you having to do anything at all! It doesn't get much easier than this. If you prefer a more "hands-on" approach, the Manual mode allows programming up to 24 fully-parametric filters (with Frequency, Bandwidth and Gain controls) to optimise your sound to the room's acoustics. The FBQ1000 is the quick and easy way to protect yourself and your audience from live sound's #1 enemy - feedback! Plus it's rack-mountable and ultra-affordable. With the FBQ1000's various modes, you can master virtually any live sound situation or use the unit as a creative sound-shaping tool. A single FBQ1000 can protect you from feedback in both your mono PA mains and a monitor mix. Your ears and your audience will thank you.